Another busy month at the boatyard with lots of exciting developments planned for 2019, including the restoration of the Victorian launch Constance, a Cornish Pilot Gig build and continuing improvements to the yard. Restoration work on Constance is now well underway with shipwright Duncan Skingly taking out the Gribble in the keel band and scarfing in new sections. A steel shoe is being fabricated to run the full length of the keel and repairs have been completed to the hatches and cockpit sole. Her first trip has been booked for the beginning of May. Chris Hardman Jones and Susie Ferris will be finishing and painting. Her electrics motors have been installed by Bob Orchard and are working well. Availability, sample menus and prices will be announced in March on the website. We are pleased to announce we have applied for planning permission to convert the Long Barn and Customs House into holiday cottages at the boatyard. We will also be installing a new, state-of-the-art sewage system for the benefit of all residents, including houseboat residents, as well as new showers and a toilet block as part of the showers. We are committed to working with local tradespeople and contractors wherever possible and hope to see benefits to local businesses as a result of the holiday cottages. 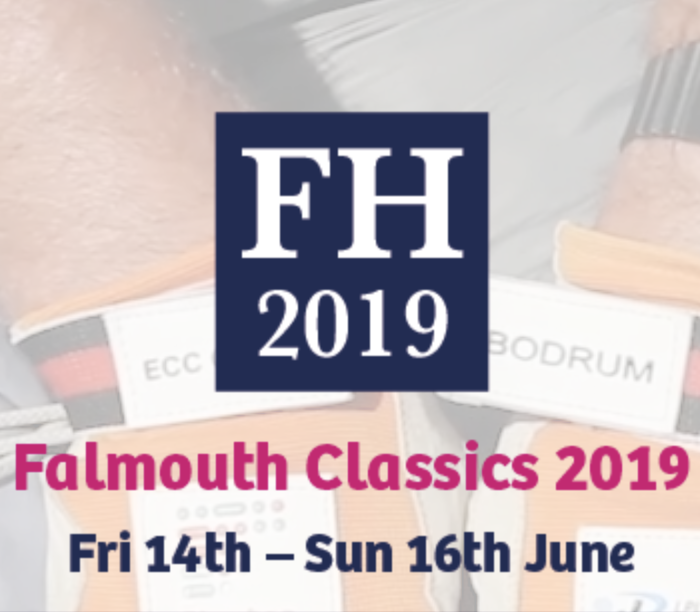 We are looking forward to Falmouth Classics which we will be sponsoring along with Ratsey & Lapthorn, classic sailmakers who have been in the business for over 200 years. Be sure to come and see us in the Maritime Village on Customs House Quay. We are extending our February discount on Hempel Antifoul and English Braids. 10% off all English Braids Stock and a FREE antifoul kit worth £8 with any tin of Hempel Antifoul. The first of six hulls for St Aubyns Estate (St Michaels Mount) are here and plugs are being made for the ring decks and internal fittings. She is being dry fitted with keel irons, moulding for steps and engines boxes being completed. If you are in the Yard, pop into the Tin Shed and have a look at the progress. Peter Martin, Cornish Pilot Gig builder, resident of Gweek, but long-time resident on Isles Of Scilly, has started work on the new build Cornish Pilot Gig. His grandson Dylan Sofio has held a long term ambition to build a gig with his grandfather and after completing a boat building course in Rhode Island and Rolts Yard, Bristol, he has returned to Cornwall and Gweek Boatyard with his friend Patrick Killian to complete this. The gig will be built from Lincolnshire Elm (Cornish Narrowleaf elm now being in short supply). Please watch the weekly progress on our website. Surian is one of the projects that Susie has been working on for her yearly refit. Repairs to the quay wall are now almost complete. As many of you know the wall was falling down along the quay frontage and was not the most inviting place for boats coming alongside. Having applied for a new license from the MMO we’ve repaired the existing wall with local stone. After a long delay and a catalogue of disasters beyond Jez and Siobain's control, CROCUS eventually made her way up the Helford River on 7th February and she is now moored up at the bottom end of the yard. We welcome them to our community in the Yard. Kylian Maria and Orlane Naour join us from their college in Concarneau for a month in March. They will be learning everything in the yard from general maintenance work and pressure washing to antifouling and engineering work. They will be our second lot of students from the school and we very much look forward to their arrival. Don’t forget our Brokerage! Vessels on our books include Audrey (Edgar Cove Salcombe 16’), Frisky ((Bermudan Cutter 25’), Jehol (Westerly (26’), Joker (Hurley 22’), Laura Lou (Bayliner 25’), Snowdrop (Deben Four Tonner), Snoqualmie (Hillyard 12 ton ketch), Susie II (Aquastar 27), Timbobbin (Dee 25). Please speak to Gemma for any further details. The Boatyard have fully involved themselves in several local groups in Gweek including the Neighbourhood Development Plan (a plan that provides the opportunity for communities to set out a positive vision for how they want their community to develop over coming years); Helford Marine Conservation Group (a voluntary organisation working to safeguard the marine life of the Helford River); Voice of the Helford (a resurrected group taking the place of the Helford River Association, to become a sub-group of HMCG) and the Marine Safety Advisory Group (water users of the Fal Estuary and Helford River, including Harbour Masters, RNLI, Coastguards, local Businesses and Leisure Groups). It has been great to hear from the local Gweek community and as always, anyone is very welcome at the boatyard for a cup of tea and chat. We are excited to announce that we have applied for planning permission to convert the Long Barn and Customs House into holiday cottages at the boatyard. The renovations will be part of continuing improvements to the yard carried out since the yard was taken over by Mark Aichroth and Malcolm Beaton in July 2017, including extensive groundworks, repairing the quay walls and tidying the site. It has been great to see many previous customers returning to the yard as well as new skilled shipwrights, technicians and contractors. In addition to the Long Barn and Customs House conversion we will be installing a new, state-of-the-art sewage system for the benefit of all residents, including houseboat residents, as well as new showers and a toilet block as part of the showers. With the Long Barn living accommodation having fallen into disrepair in recent years we are looking forward to restoring it to a high standard with care to preserve both buildings' original features and celebrating their part in Gweek's fascinating maritime past. Gweek Classic Boat Yard is preparing for Christmas: the Gweek Christmas lights are looking wonderful and we have the anchor illumination on the cafe. The Yard Christmas party took place on Friday and everyone is now looking forward to time with families and a recharge before an exciting next year. The Gweek Classic Boatyard team at the Christmas party on Friday. Thanks to The Boatyard Cafe for hosting us! Gweek Classic Boatyard is pleased to announce a partnership with Ratsey & Lapthorn, the famous sail makers in Cowes. Ratsey & Lapthorn have been making sails since 1790 and have a fantastic heritage behind them: the chandlery will stock Ratsey products and we will have sail examples so customers can choose the Ratsey sails they will be interested in. Ratsey will also offer a cleaning and restoration service from the boatyard. Ratsey and Lapthorn will also support Gweek Classic Boatyard at the Falmouth Classics. Gweek Classic Boatyard is now a partner sponsor for Falmouth Classics (14th - 16th June). 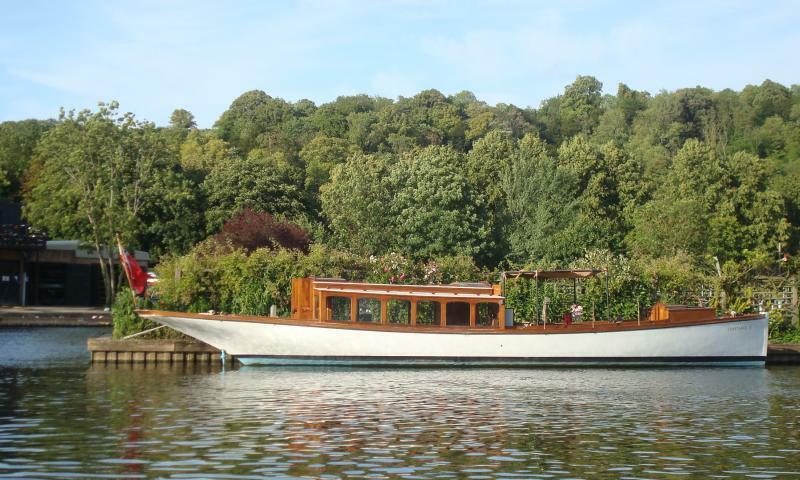 We will be entering Sara and the electric Victorian Launch Constance II will be taking part in the Parade. We will have a tent on the Haven and plan to showcase our partnership with Ratsey & Lapthorn. Constance II is now safely tucked up in the Britannia shed. The motors are being replaced and she is being prepared for commercial service for this summer offering tours on the Helford River. Ian Munday is leading this process along with Duncan Skingley who will be doing the work. Speedwell of Cremyl, a Buchanan 49ft Bermudan Yawl, is undergoing her first major refit since being built at Mashfords in 1962, by shipwrights Andrew Massey and Duncan Skingley. The ballast keel and false keels have been removed in order to inspect the keel bolts and allow the removal of the strap floors for blasting and galvanising. The deck, original and traditionally laid, was leaking badly requiring all seams to be raked out and recaulked. In addition to this both hatch garages will be replaced and the original galley layout will be reinstated. This was changed at some point in the past when Speedwell served as a sail training vessel for a number of years. Susie Ferris is varnishing all brightwork and painting topsides, anti-fouling and repainting 64 ft mast and spars. We also have Eileen, a 1920 traditional Cornish Looe Lugger built by Curtis & Mitchell of Looe, in for new decking and planking. We wish all our customers a Happy Christmas and look forward to seeing them in the New Year. A busy time for the boatyard with lots of boats to crane out and storage space filling up quickly. We are into the full swing of craning boats out and it is progressing very well. We are enjoying the increased space on the yard form the ground works undertaken during the summer and the new team has really got into the swing of things. Luke Jones has taken over from John Henderson who has gone on to pursue other interests. Luke has come to us from Fugro Seacore where he ran three of their yards and was responsible for modular and drilling plants and has brought skill and precision to the crane operation. Luke also previously worked at Macsalvors doing precision lifting with their large crane fleet. Joining Luke is Jerome Pickles, a highly skilled engineer who now also lives on the yard. The office team has been supplemented by Amber Tresahar, keen classic boat sailor and owner of Kittiwake. A qualified lawyer and former Kirov Ballerina, Amber has brought a lot to the yard already. Her background makes her well suited to the demands of Gweek Classic Boatyard. Anne Oliver has now been with us for over 6 months and has brought significant order to the day-to-day operations on the yard. We have a great team ably assisted by Gemma and Tammy in the office and we look forward to the upcoming season. It seems only a short time since we were gearing up for the spring and summer season and Falmouth Classics already seems a distant memory. The cafe has been a resounding success and we have to congratulate Susie Goodwill on what has been achieved. Gweek Classic Boatyard is becoming more of a destination as the project progresses. The cafe has moved to winter opening hours. They are now licensed and will be open late on the first Friday of every month from 6.00pm onwards with a wood fire, music, drinks and food on offer. Sunday 1000 –1300 for breakfast only. We had two French interns during September who brought a cheerful atmosphere to the yard. We would like to continue a structured intern programme and offer holiday internships to one or two local boys or girls. This could start as an initial trial but become something more regular. It is open to local young people and they must be 16 or older. Passion for boats and sailing will be preferred but attitude will be the most important deciding factor. CVs should be emailed to mark@gweekquay.co.uk. The yard has recently acquired a share in an exciting classic boat. Constance II was originally owned by the Shuttleworth collection and was built in 1895. The boat was used to shuttle crews form the Royal Yacht Squadron in Cowes to the racing yachts in the Solent. Constance II will be restored over the winter and is planned to be offered for charter next season. The boat is electric, having been converted from steam, and is now outside the chandlery. Pop down and have a look and enjoy a coffee in the cafe. We are welcoming new boat builders to the yard and I plan to be able to update you in our next newsletter. The chandlery is being revamped and has a new layout. Old stock has gone into a boat jumble with some great prices on weird and wonderful products. English Braids are restocking our ropes and we have an improved selections of paints and antifouling. Seaware of Falmouth have been most helpful in getting us re-established and providing a fast delivery service. If there is anything you need we can normally obtain delivery next day. The new fork lift has been rebuilt by Malcolm and is now undergoing final testing before being used. Winter storage is booking up quickly so be sure to contact the office on 01326 221657 or info@gweekquay.co.uk. We have now owned Gweek Classic Boat Yard for over a year. It has been exciting and challenging in equal measures. Our customers and partners in the community have been a major support and we thank you for the helpful pointers along the way. We are not there yet by any means but we continue to advance. We have new boat owners at Gweek for the winter season and we are enjoying welcoming back our regular customers. Thank you for helping to make the boat yard a vibrant part of the boating community. Gweek customer and owner of ‘Ariel’ Simon Sinnott is taking part in a banger rally from St Austell to Morocco to raise money for three charities. From 30th September to 5th October the 200 teams taking part in the Gib or Bust Banger Rally Challenge will take on the five-day adventure spanning two continents, five countries and 2250 miles, completing daily quizzes and challenges along the way. Simon’s team is called ‘Ramsay’s European Nightmare’ and they will be raising money for three charities: Penhaligon's Friends, Living With Hip Dysplasia and The Christie NHS Foundation. You can read more about the three charities they’ve chose on the ‘Ramsay’s European Nightmare’ Facebook page. Last year the Gib or Bust Rally Challenge raised over £750,000 for charities across the UK. They’ve got a YouTube channel where they’ll be posting daily updates on their progress. You can find out more about the team on their Facebook page Ramsay's European Nightmare - Gib or Bust 2018. If you’d like to donate to their cause, you can do so on their JustGiving page here. We’d like to wish Simon and the rest of the team lots of luck from all of us at Gweek Boatyard. After a busier than expected summer a long overdue newsletter. The summer has seen us continuing the ground works and preparing for the new houseboat moorings as per the original planning. We have received a lot of interest from people wishing to relocate on a houseboat to Gweek and we are determined to ensure that we have the right people and the right boats. As part of our ongoing commitment we have also acquired neighbouring land which will help as we improve parking. We have also acquired new toilet blocks: these will be arriving over the autumn, with new showers and laundry facilities being planned for Spring next year. The Boatyard Café has been a great success over the summer and we are delighted at how it has created a new vibrancy in the yard. Well done to Susie Goodwill and her team. Thank you for your support. Gweek Classic Boat Yard continues to plan to support traditional boat building and repair. More classic boats are returning this year and we have two French boat building interns joining us for the autumn. We are in full swing preparing for the autumn lift out with both old and new customers returning. The new US fork lift is being reassembled and is planned to be here for October. This will improve the process for smaller boat dramatically. The crane has been re-certified and we have taken delivery of new spreader bars. Please contact the office to reserve your space if you have not already done so. Gemma Gilbert recently got married to Alex Morris at the Greenbank Hotel. Gemma is known to many as the helpful first point of contact with the yard. Gemma is currently on honeymoon and we wish her and Alex many congratulations. Amber Tresahar has joined to help the admin team on a part time basis. Amber, a wooden boat owner and sailor, brings a depth of experience. She is a former ballerina with the Kirov and a qualified lawyer, and we are delighted she has come to join us. Luke Jones has joined us as Senior Yard Man and Crane Driver. Luke has joined us form Fugro Seacore where he was the Nearshore Plant Superintendent. Luke also has extensive craning experience having also worked for Macsalvors, the established national craning company. Luke will take a big role in health and safety and improving the overall technical operation of the yard. Jerome Pickles has joined us from Somerset where he worked with AM Beaton. Jerome has had a number of years working with Malcolm and brings significant skill as a mechanic. Jerome lives on site and brings a calm and can-do attitude to his work. Boatyards are about people, and I am now confident we have the right team to go forward with the yard. Please do make a point of introducing yourselves if you are visiting. Anne continues to make a difference managing the operation and we are enormously grateful for the work she does in what can be a challenging role. It is always difficult managing the many competing priorities. Thank you to the customers who took the time to complete the craning survey. The feedback has been,for the most part extremely positive, however there are areas where we could have done better. These include stomping onto someone's pride and joy, recently repainted, in muddy boots. We now have overshoes so I hope this will be improved. The other big issue was not running to time and not being accurate with crane out times. This will improve with new administrative procedures in place, but as always, the best laid plans can sometimes go awry when trying to cater for everyone. "Very responsive to timing and use of crane while boat was pressure washed and antifouled." "On time, considerate and helpful." "Very quick and efficient service. Considerate and caring for boat too." We scored an average of 4.3 out of 5 based on feedback from everyone who took the survey. Well done to the team for their hard work craning everyone in. Mark and Anne have kindly been invited to join this committee that has been in existence since the 1980s with scientific experts in many areas. The work of this group in supporting the wildlife and future of the Helford River is remarkable and we have now become sponsors of the organisation. You can find more information on their website here. The chandlery has seen steady growth over the year. English Braids have been in to expand our range of ropes and webbing to cater for running rigging, docklines and mooring lines. 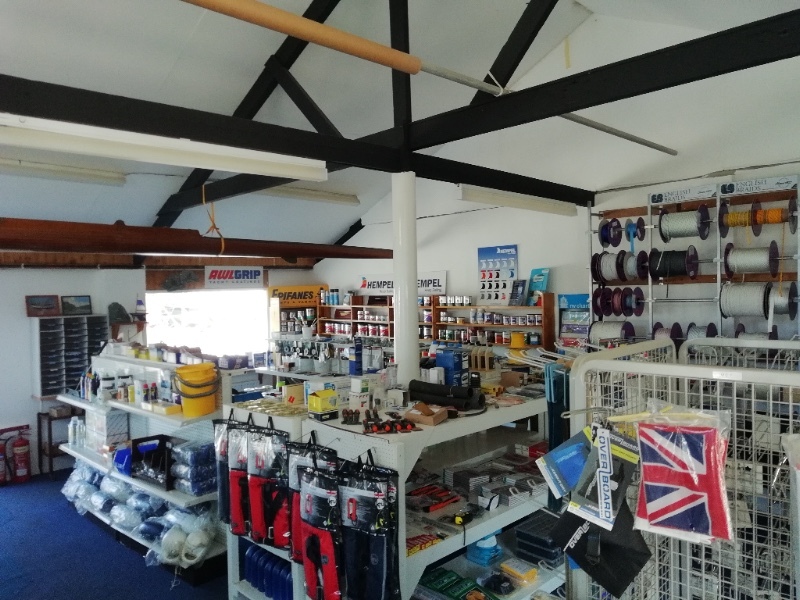 We are also in consultation with Seaware to bring the chandlery stock up to what you would expect to find in a boatyard like Gweek. New stock will include everything from sanding materials to antifoul and hopefully everything else in-between. If you can’t find what you are looking for on the shelves, please let us know as in most cases we can get next day delivery. At the end of the summer some owners, for various reasons, wish to sell their vessels; please have a look at our online brokerage which includes a lovely 16’ Salcombe Launch, Hillyard 5 tonner, Hillyard 12 ton ketch, Hurley 22, Moody 27 and Campion motor launch. Along with other services, we now have a local man, Paul Read, who is available to valet your vessel, inside and out. If you require his services, please contact the yard for more details. As we continue to tidy the yard, we would respectfully ask that all boat owners keep the area under and around their vessel clean, tidy and litter-free. We want to be good to the planet so boat owners please do not scrape off you boats without laying down sheets to collect the antifoul. We seem to have dog fouling under control but please keep dogs on leads at all times. It is World Clean Up Day on 15th September - Clean Ocean Sailing are organising an event where boat owners collect a bag of rubbish/plastic from the sea and send in a picture of them with their boat and the rubbish they've collected (creating a kind of virtual flotilla). Find more information about the event on Facebook here. Check out their website or follow them on Facebook. A busy couple of months at the boatyard and lots of good weather. This summer has really started well. Most of the boats are back in the water and it is great to see them being used. The yard participated in the Falmouth Classics and we had a stand on Custom House Quay. The yard entered a hastily got together Deben 4 tonner called Sara in the two races. Sara was suited to windier weather and came last in our class both times, however it was fantastic to see some of the wonderful classic boats on the water. Duncan Skingley entered Sunfish and enjoyed a good performance. We established a tent on Custom House Quay and enjoyed meeting and greeting old and new friends and customers. Baggywrinkles were being made on the stand and well done to Steve, Darren, Mark and Phillipe who knew what we were up to! Wrong answers included Sail Buffers, Ra Ra Skirt, Cargo Net and Cat O' Nine Tails. The Boatyard Cafe provided a 'cafe in a box' for the stand and we shared some space with Clean Ocean Sailing, who were on the Quay for the weekend along with volunteers spreading the word about their ocean cleanup (they even managed to squeeze in a cleanup of the harbour in their canoe). Many thanks to all those who came along to say hello. We had Susie Ferris, Duncan Skingley, and Troy Christensen on the stand over the weekend along with pictures from Andrew Massey. Anne Oliver has joined as Yard Manager at Gweek Classic Boat Yard. Anne joins us from Falmouth Haven and a career working with boats on the Fal. Anne brings great organisation and enthusiasm to the role and is already known to many of our local boat owners. Please say hello to Anne if you are visiting. Lizard Marine will no longer be offering marine mechanical engineering services at Gweek and we are looking to new providers to offer this important service. Amanda Champion joins us from a nationwide French polishing company. She previously worked on interior yacht finishes at Pendennis Shipyard and as an antique restorer. Based at Gweek, she is undertaking furniture restoration and yacht interiors. She specialises in wood, leather, marble and composites. The Boatyard Cafe now has opened the garden seating area. The menu continues to expand and we are really delighted with the success so far. We now have wireless internet across the yard provided by Wildanet. Fast download speeds are afforded by a direct link to Goonhilly Earth Station. More details can be obtained by visiting www.wildanet.com. Our 35 tonne forklift has arrived from the USA and will be ready for lifting out smaller boats in September. This forklift can lift boats up to 12 tons and a maximum of 30ft. It should improve the lift out process and offer a better service to our customers. Bookings have started to come in for the autumn lay up and undercover space if filling fast so if you do have an under cover project planned please let us know as soon as possible. Please also get in touch to book your space ashore for the winter. We have had some exciting projects on the yard keeping all the teams extremely busy. These have ranged from repairing a large ferro concrete boat that was damaged in the winter storms to major wooden boat refits carried out by Andrew Massey and Duncan Skingley. The chandlery has been restocked and we are able to offer great value life jackets as well as many of the bits you may need for your yacht. There is a good selection of nuts, bolts and screws too for any DIY project! If there is anything you need that we don't have in stock, we can order and get it for you normally the next day. As the redevelopment of the western area of the yard continues we are looking to offer some new moorings to selected houseboats. These will be ideally suited to wide beam narrow boats and Dutch barges. For more details please contact the office. We would all like to wish you a wonderful summer and look forward to seeing you in the autumn. Having just enjoyed a wonderful weekend of weather at Gweek I thought I should update everyone with a newsletter. May has seen new prices. Prices have gone up and now include the new pricing for stands. Many customers need to adjust their direct debit to allow for the price increases so please take a look at this if you haven't already. We have been careful to ensure we are still competitive and good value to trek up to Gweek and store your boat. Under cover storage is proving increasingly popular and we are already receiving bookings for the autumn. While the boats are out for the summer we will continue to make improvements to the hard standing and the electrical infrastructure. Our team at Gweek Classic Boatyard is increasingly busy with Chris Hardman Jones and his fibreglass team working relentlessly. Andrew Massey and Duncan Skingley are turning around boats with some of their historic boat restorations being completed on time. Susie Ferris has been relentless with the paint brush and making many of the boats absolutely gleaming. Troy Christensen is now set up with his marine electronics business. He is now a Raymarine installer. John Henderson, our onsite marine engineer, has also been very busy with Lizard Marine. This week we also welcome a new member of the team to Gweek: Anne Oliver. Anne was Marine Assistant at Falmouth Haven for three years as well as working on the patrol boat and in the workshop there, before which she spent spent seven years as Seasonal Patrol Officer with Truro Harbour Authority. We are very pleased that the team is growing and excited to have Anne on board: she is sure to be a huge asset to us here at Gweek. We are looking forward to Falmouth Classics the weekend of 22nd - 24th June. We will have a stand in the Maritime Village on Custom House Quay and will be sharing the stand with the team from tendrr, who are about to launch an online platform for sailors providing tools to help you plan your sailing calendar and identify nearby opportunities to get out on the water. You can read more about their new platform as well as how to win yourself some free Henri Lloyd sailing kit on the website here. The St Ives lugger Barnabas, owned by the Cornish Maritime Trust, spent some time at Gweek over the past few weeks as it had some work done in preparation for a trip to the Scillies over the bank holiday weekend. We'll share more photos later this week on the website. We recently came across tendrr: a new platform designed to get sailors out on the water more. It's free and is set to launch in mid-May, offering a range of services to help you spend more time on your boat. Essentially, the platform has three functions: you can plan your sailing season, link up with boats, crews and sailing opportunities near you, and build up a record of your sailing trips and experience. Their scheduling tool helps you to manage your sailing calendar in one place: you can schedule trips with your regular sailing crew, find out about major sailing events and plan cruising trips through the year. tendrr also helps you find sailing opportunities near you with their CrewMatch service which connects you with available crews and boats. Their SailingCV lets you record your sailing trips and positions you've filled, and find other sailors near you, helping you grow your network. The platform should be launching mid-May, and in the meantime the team at tendrr are running a referral campaign in the run up to the big launch: refer your friends and you can win free Henri Lloyd sailing kit. Sign up here. Like us, tendrr are sponsoring Falmouth Classics. You can find out more and sign up to up their mailing list on their website tendrr.co. We are all looking forward to the end of the winter after a testing first year with constant gales and even snow. Fortunately we have fared pretty well and are seeing increasing numbers of boats booking to come in for work. It is a busy time as everyone is preparing to get their boats ready for the season; the sales in the chandlery have increased and the preparation/application kit with anti fouling has been very popular. Susie Goodwill opens the Boatyard Cafe this weekend. You will be able to enjoy delicious barista brewed coffee as well as snacks and meals right in the heart of the boatyard. This has been a big project for Susie and we are delighted with how the cafe looks. The hydraulic boat trailer has been completely renovated and preventative maintenance on the crane is being continued, carried out by John Henderson who is increasingly busy with Lizard Marine. Bookings for his work can be made through the office. This week Malcolm Beaton has virtually single handedly rebuilt the slip way wall by the Boatyard Cafe; a stunning piece of work. The new fork lift is in transit from the USA and a new lifting pad is being created to accommodate it. This fork lift can lift 12 ton motor boats up to 30ft in length. Mark Aichroth repositioned the channel marker buoys that had moved during the storms. At the time of writing they are in the correct places and will be regularly checked. This week we have had the pleasure of Adrian Dyer from Salem California volunteering at the Yard. He has worked on square riggers in the USA and was keen to help out at Gweek Classic Boatyard. Adrian was invaluable in getting Sara, the yard’s 1936 Deben 4 tonner into better shape. We are most grateful to Adrian for his help and we look forward to him revisiting later in the year. This year we are very proud to be sponsoring the Falmouth Classics event; more details can be found on the Falmouth Classics website. We will have a tent in the trade village and look forward to welcoming our customers. We'll have a presence at the event along with Lizard Marine, Troy Marine Electronics, Duncan Skingley and Andrew Massey in attendance. Mark Aichroth will be racing Sara and we hope to see a number of our boat owners at the event. Please note that price rises will be implemented for the month of May. May invoices will be sent out in mid April. Lastly and most importantly we need to be mindful of the environment. Please can boat owners be responsible with their unwanted engine oil and take it home with them. I hate finding buckets of oil lying around for us to dispose of. Please place sheeting under the area of the boat your are antifouling. Hull spraying off will no longer take place on the craning pad. When engine testing please be careful of any exhaust oil going into the river. Your cooperation is appreciated. We have had a very wet and blowy winter and all at the yard cannot wait for Spring. We have had the house boat pontoons blown around and nearly weekly storms with 40+ mph winds. Fortunately no damage done so far but has been a constant reminder of the routines of owning a boat yard. I thought I would update on progress. Andrew Massey, Duncan Skingley, Chris Hardman-Jones and John Henderson have now rented workshop space at the yard and become approved contractors. We are looking to welcome more boat builders and related craftsmenonto the yard with introductory deals. Classic Boat magazine will feature this aspect and do a report on the yard in the first half of the year. Susie Ferris has helped us to put together anti-fouling packs for those needing all the tools and materials to anti-foul their boat. These include brushes, rollers, tape, primer and anti-fouling. If you don’t want to do this job we are happy to take on the work. Please speak to the office. We will also be offering a valeting service to get all boats nice and clean to go back into the water. This will include a full clean inside and outside. We are looking at implementing a parking system at Gweek Classic Boat Yard. Boat owners and contractors will be entitled to park, however visitors to the yard will be charged. This will improve the parking situation and make it fairer for everyone. Troy Christensen has worked tirelessly to improve the reliability of the electrics at the yard. He has increased the power supplies so this should reduce the drop in current to the house boats. Troy has also set up a marine electrics business at the yard and has now given up his London job to move down to Gweek, restore his yacht and start the new business. He will still occasionally return to the London area to race his Musto Skiff at the very top level. John Henderson is busy setting up Lizard Marine and already has a growing order book of work for the yard. Our undercover space is increasingly being taken and we are very excited with some fo the wonderful boats that have come onto the yard for work. Holly Carberry has joined our team to help and improve with some of the communications. Please let us know if you would like to announce anything in this newsletter. Gweek Classic Boat Yard now has a deep water mooring on the Helford that is located between Port Navas and the ferry landing. The mooring is suitable for a deep level boat up to 35 feet and can be rented for short or long periods. Please contact the office for a quote. The yard with Lizard Marine also will have a rib positioned at Helford to help where possible any customers that have need of our services or any mechanical breakdown. We are all looking forward to Falmouth Classics in June.We will be racing one of the yard’s classic yachts; Sara, the Deben 4 tonner. We are a major sponsor of the event and will have a stand in the event village. It would be great to see you there. Classic Boat will be doing a feature on Gweek Classic Boat Yard later in the year about the development taking place and new services available. Look out for our ads in next month's issue. Susie Goodwill will have the café open in April and we are all looking forward to being able to see the project finished.